Big Idea – If deep meaningful relationships are important in your ministry than you will do what it takes to create them. Empower small group leaders to make a difference in the lives of the kids they lead. 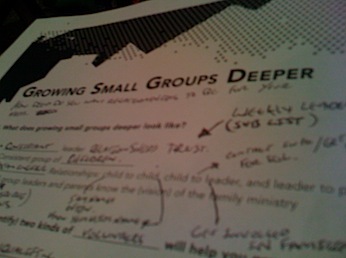 Be a resource to Small Group leaders so they can be a resource to parents. Best Thought of the Day: Your child’s best day of the week should be at home not at church. What systems have I created that facilitate constancy in relationships? How can I find out what resources our parents need? Am I passionate bout relationships? Do I model them? Are my small group leader filling space or touching lives? Great video below from Chad and Autumn Ward’s church where they partnered with parents to do an event that describes baptism.